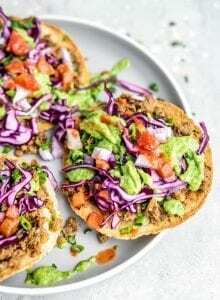 These fun veggie tostadas are surprisingly quick and easy to make, especially if you’ve cooked the lentils ahead of time. Top them with a yummy, tangy avocado cilantro sauce and your favorites like salsa, cabbage, onion and carrot. Place as many tortillas as you need in the oven straight on the rack and bake until brown and crispy. Keep a close eye on them so as not to burn them. Once they’re crisp, remove from the oven and place on a baking sheet to await their toppings (or just plate them as placing them back in the oven is optional). Add the cooked lentils to a pan with all spices and broth (or water) and cook for 10 minutes or so. Mash some of the lentils with the back of a spoon until it resembles a refried bean-like texture. Add more water if it starts to dry out. When everything is ready, spread some re-fried beans over the crispy tortillas. Add a scoop of the lentils to each tortilla. Top with desired toppings such as carrots, peppers, cilantro, nutritional yeast and green onion. Optional: place back in the oven on broil for 5-10 minutes for one last crisp. Just keep an eye on them, they should be nice and crispy and fully heated. Remove from the oven when finished and top with the avocado sauce. Makes about 6-8 tostadas depending on how many lentils you add to each. Adjust the topping ingredients for how every many you’re making. These can also be served as tacos or rolled up into burritos.